Sometimes, the cost of the items purchased does not turn out to be as expected. The cost is too high than the one that was quoted at the start. In such a case, you may feel some financial crisis. To deal with those financial problems, you can write a letter in order to request for the charges of each service individually that you have rendered in the specific period. Getting the complete billing detail is your right. However, you can only be able to get the complete detail when you write the request letter effectively. The most effective way to write this request letter is to give the complete introduction of the services rendered. It is important to mention the date at which you received the bill. The date on which you rendered the service should also be mentioned. Specify the address where the service was provided. It is also important for you to mention the expected amount of money. You can tell the reader that you could not understand why the cost of the service exceeded this much. At the end of the letter, request the reader to provide you with the list of itemized charges for services rendered. Sign your name and other details at the end of the letter. The most important thing to keep in mind is you should not pay the bill until you confirm the total amount of money you have to pay. 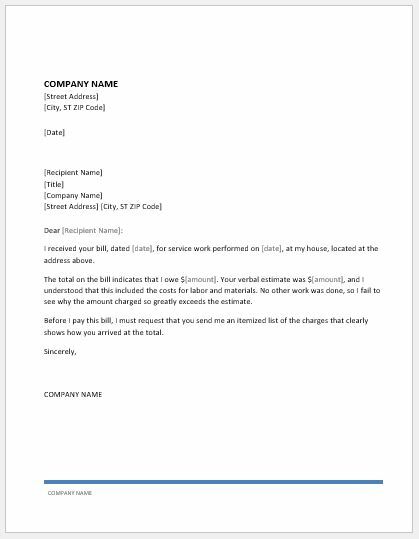 Write the request letter as soon as you receive the bill. Mention all the services that you rendered and also mention that you have not taken any additional services except for those quoted initially. The format of the letter is the most important thing to consider. It should be known that how can you format the letter in a perfect way to get the desired response from the reader. Use a proper way to greet the reader. The following letter is all in ready to use format. DOWNLOAD, make suitable personal changes and it is ready to deliver.